Take a half day outing highlighted by a visit to historic Anderson Cave where escaped slaves sheltered during the Civil War. You’ll explore our Randall Glen mountain with a local guide who’ll entertain you with local legends, history, and tall tales. You’ll take an easy hike across our pastures, taking in the view from atop our paleo Indian mound. 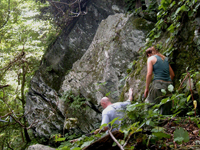 Then you’ll traverse the wooded mountainside and scramble over mossy boulders, passing by a coyote den, to reach a rock cliff. Keep an eye out for wildlife, wildflowers, and Native American artifacts! 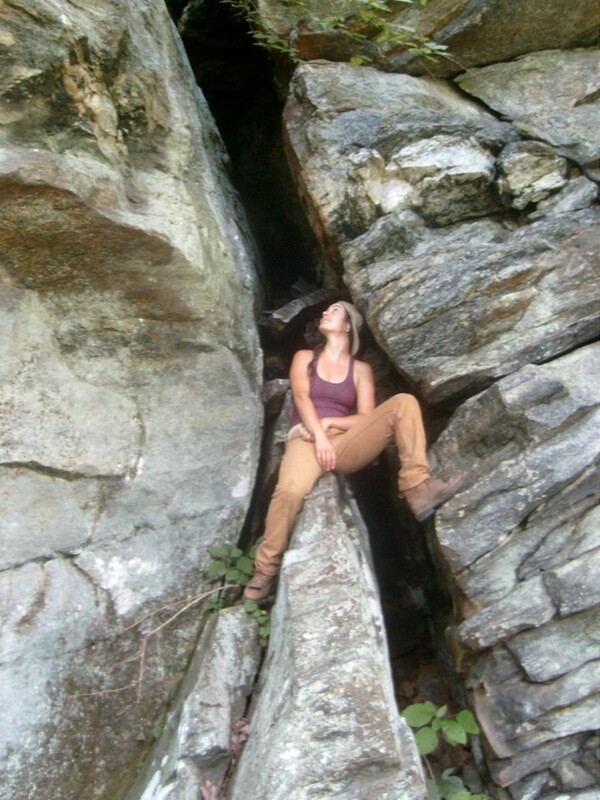 Following a trail that’s been used for centuries, you’ll climb a narrow crevice in the cliff and explore the entrance to Anderson Cave, hundreds of feet above Randall Cove. From Anderson Cave you’ll continue across the mountainside and come out into open meadows with a breathtaking view of the mountains and the valley below. Surrounded by this panorama you’ll stop for a hearty mountainside lunch. Climbing to the top of the mountain ridge you’ll reach a log settler’s cabin and explore it to see how the pioneers lived. Returning down the mountain you’ll hike alongside Randall Creek and visit our little waterfall. You might like to top off your hike with a little wading! And you’ll come home from this hike with some real adventure stories. 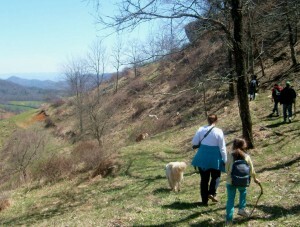 The Mountain Hike and Cave Adventure is available by advance reservation. The outing is $125 per person and includes lunch. The outing requires a minimum of 2 persons, with a maximum of 8. Participants should be age 10 or above, physically fit, sure footed, and should not have a fear of heights. To make a reservation, email us at info@RandallGlen.com or call 828-683-5758.